This year’s Wyoming Stock Grower’s Agriculture Land Trust picnic was a celebration for many reasons. This year’s festivities entailed white linen tablecloths beneath beautiful white tents, a two-piece band, an abundance of flowers and gorgeous views of the Absaroka Mountains. The celebration served numerous functions; primarily as a benefit auction and a showcasing of our ranch. 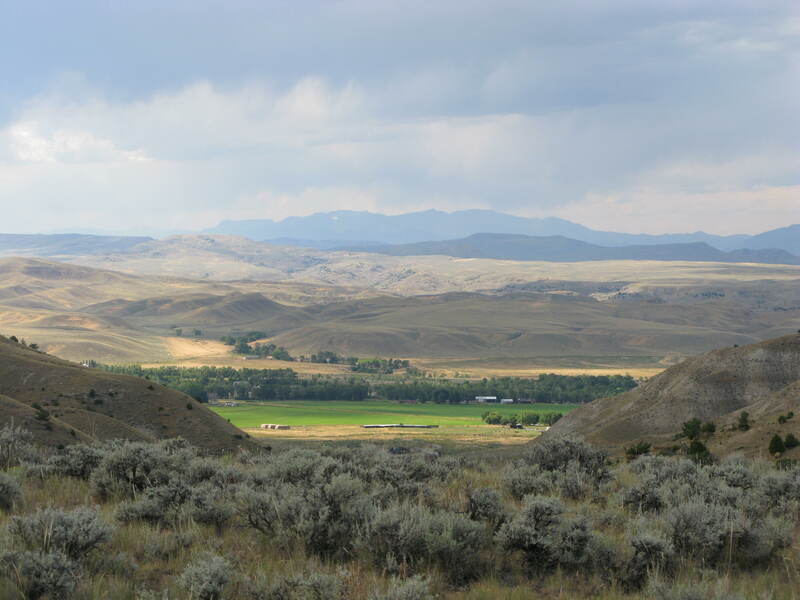 The Hat Two Ranch, north of Meeteetse, was placed in a conservation easement with the Wyoming Stock Grower’s Agriculture Land Trust in 2010. The conservation easement began in 2008 with the application and selection process. We first investigated the conservation possibilities in order to maintain the ranch. A buyer had made an offer on our place. Although the offer was tempting, the family all decided to persevere. Times are tough, and even tougher when operating on borrowed money year after year. A ranch is profitable if the land is paid for. We decided not to sell and began the process of selling the conservation easement to the Wyoming Stockgrower’s Agriculture Land trust. We did this to maintain ownership; to remain in the ranching business and to NOT sell out. This is not the place to provide details of a conservation easement. For further details of the opportunity to help preserve open spaces of Wyoming, I encourage you to visit the WSGALT at http://www.wsgalt.org, to learn more. Our Hat 2 Ranch, north of Meeteetse, was selected for conservation purposes because of it’s wildlife habitat, it’s close proximity to other conserved acres and our family’s intent to keep it as a working cattle ranch. Yes, we did donate a portion of the easement to the Wyoming Stock Grower’s Agriculture Land Trust. This eased our family of the huge financial strain of paying for and maintaining our ranch. We are now at liberty to stay under-grazed with our cattle herd; leaving ample habitat for the numerous wildlife. We can now have a comfortable living standard. We even went on our first family vacation, ever! The 2011 WSGALT Banquet celebration at our place in Meeteetse was more than a celebration of this conservation easement. It was more than a celebration of maintaining the ranch for our children and grandchildren. The bipartisan efforts to see the easement project to success was reason enough for the celebration at the Hat 2 Ranch. I offer my deepest gratitude to everyone who helped and supported in the success of this project. I consider myself a conservative of today’s political realm. Politics are leaning further to the left regarding the issues concerning the ‘Green Agenda’ of this century. My voice is effective, not only in defending nature, because I have put my money where my mouth is, but also in advocating the necessity of both political parties coming together to conserve open spaces and our way of life for future generations. We are all stewards of conservation, whichever side of the political fence we ride, or write. No one wishes to see the wide open spaces of Wyoming developed. With this notion, that each of us is a conservative, I write of the only plausible conclusion generated from the successful WSGALT banquet: the agriculture community, the recreation community and the oil and gas community of any political affiliation. We see one common goal of maintaining freedom from federal control of our private and state lands. To maintain our state’s sovereignty, we must work together. We must work together, now, to preserve our natural resources as well as multiple use of our lands. I challenge you, the citizens of Wyoming: ranchers, farmers, professionals, hunters, anglers, students, rednecks, roughnecks and environmentalists to come together again to be national advocates to other states seeking to maintain state control of unique wild resources. Sign up for the blog to be notified of updates and comments. Or send me your photos of the party to be shared.